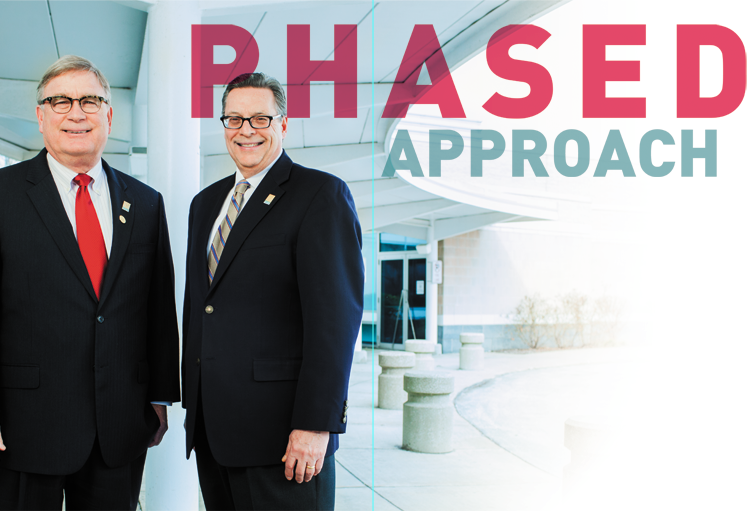 Edward Kleinert and Gerard Hourigan split Cuyahoga Community College’s network refresh into three phases to avoid overburdening the ­college’s debt load. Meticulous planning and pre-installation testing made all the difference to the upgrade’s success. With more than 50,000 students and nearly 4,000 faculty members and staff spread across multiple locations in Ohio, Cuyahoga Community College — or Tri-C, as the locals call it — is really a midsize enterprise. So it's no surprise that enterprise-level IT services are required to keep it running. Tri-C's information technology services department recognized a little more than a year ago that much of the college's Cisco Systems–based network was nearing the end of its supported life and needed to be refreshed. Many switches were 8 years old and needed to be replaced immediately. Plus, the explosion of mobile devices on campus required a much more robust and reliable Wi-Fi network. But a refresh meant a multimillion-dollar project, and too much of a burden on a single fiscal year's budget for the publicly funded school, says Edward Kleinert, executive director of enterprise infrastructure services for the college. Instead, Tri-C split the project into three phases, spreading the total cost over several years. "Ed designed a well-thought-out strategy that allowed us to phase in new equipment without overburdening the college debt load," CIO Gerard Hourigan says. Tri-C completed the first — and largest — of the three phases this year, installing 29 Cisco Catalyst 6509-E switches, 84 Cisco Catalyst 3560-X switches, 100 Cisco Aironet 3600 access points and two Cisco Flex 7500 wireless controllers. The tricky part was figuring out what equipment should be replaced first, and how to manage the process and implement changes without disrupting classes or back-office operations. Further complicating the process was the fact that Tri-C lacked the space needed to store, configure and test all of the hardware required for the refresh. The solution? CDW's buy-and-hold program, which enabled Tri-C's equipment to be configured and warehoused at CDW before being shipped as needed to the appropriate campus. By far, the greatest benefits of the network refresh have been faster throughput, greater capacity and a much more stable environment, Hourigan says. Providing a reliable and robust network is pivotal to ensuring effective and efficient college operations, he says. "Everything runs through our IP network, from the HVAC to the door locks to the surveillance cameras. Even the vending machines are networked." As more students and staff bring their own devices to campus, the Wi-Fi network has been particularly stressed, Hourigan says. "The average number of endpoint devices per user is almost three," he says. "Everyone is carrying a notebook or a smartphone or using a desktop, and often all of them are online at the same time. We are constantly making sure whatever devices that need to connect can stay connected." "YouTube and Internet video are becoming more and more a part of the process in our classrooms." To handle the load, Tri-C increased the number of wireless access points at its locations from 250 to roughly 350, deploying 100 new Cisco Aironet APs and two wireless controllers. "We knew we had to overhaul our wireless network," says John Betts, a Tri-C network services technician. "We wanted to increase our 802.11n footprint and centralize our wireless infrastructure across all of Tri-C's locations." Working with CDW Wireless Solution Architect Jay Myers, the team decided on the Aironet 3600 and Flex 7500, Betts says. Tri-C also pumped up its bandwidth, replacing 100-megabit connections to computer labs with 1-gigabit connections. "YouTube and Internet video are becoming more and more a part of the process in our classrooms. It will be a constant challenge for us to make sure we can deliver video smoothly to our faculty and students," Kleinert says. Today, the bulk of the refresh is complete, but two phases remain. Next up is refreshing the switches in the primary data center and main distribution frame. Tri-C currently uses Cisco Catalyst 4507 switches, "some of them very sparsely populated with boards," Kleinert says. "It's just not economical to replace them with like-for-like hardware." The team found that two Cisco Catalyst 3560-X switches could be installed at less cost while achieving redundancy, he says. Hourigan says Tri-C also is looking at virtualizing its desktops, which was another project that couldn't be done until the network was upgraded. The second phase will incorporate the main switches at the data center and disaster recovery site, replacement of Cisco 3550 Series with the 3560-X, and more wireless access points. Phase three will incorporate replacement of the 4507 switches and still more wireless access points. "You can't expect most schools to be able to perform an upgrade like this all at once," Kleinert says. "We needed to identify where the weakest links in our network were and systematically replace them. You need to have the end game in mind, but do it in stages so that you can afford to do everything that needs to get done. There must be a solid implementation plan in place."